If you are looking for relaxation in a remote beautiful setting, then Santorini is perfect! 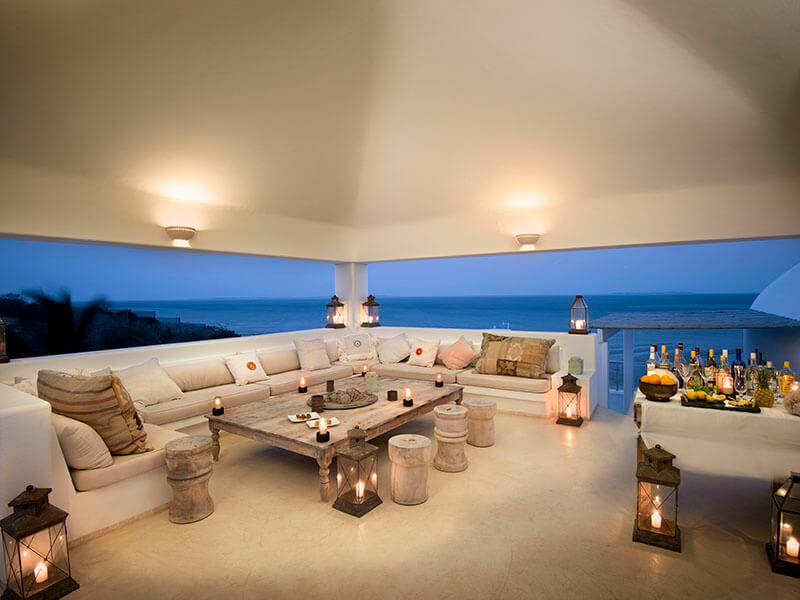 The Villas are situated a few kilometres north of the mainland coastal town of Vilanculos. With panoramic bay views from its secluded, elevated position. 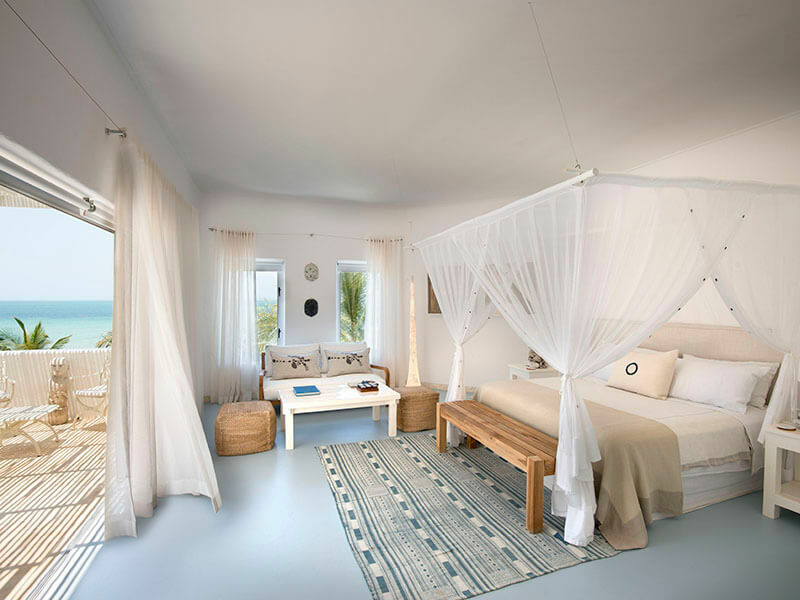 What makes Santorini magnificent are the details: Beach bags and flip-flops, picnic lunches, stunningly set private tables with the most delicious food you will experience in your travels around Mozambique. Suited to friends or family travelling, it is the perfect getaway! Nestled above the red cliffs of Kingfisher Bay in Vilanculos, Villa Santorini has an unfurling view of the Bazaruto Archipelago islands and curling mainland in the distance is unsurpassable. 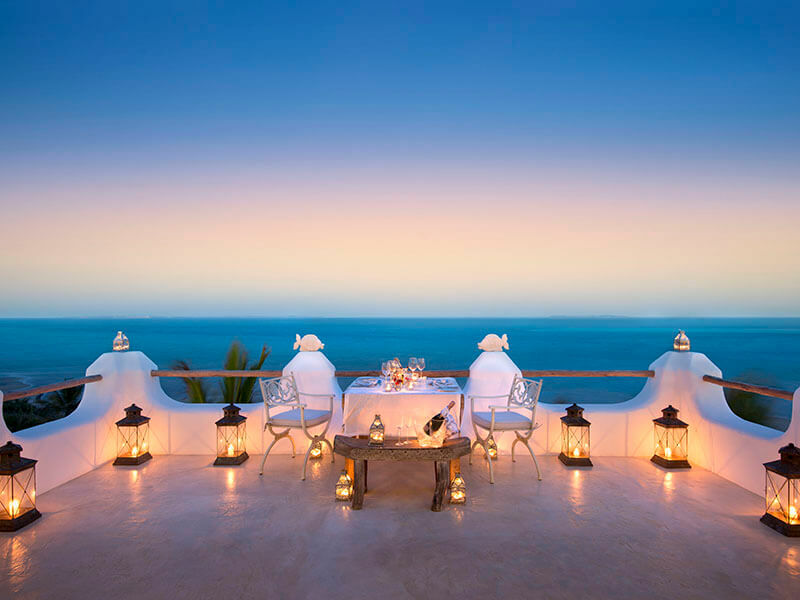 Santorini Villas Mozambique is like a small Greek village in the heart of a raw African landscape – a magical combination! 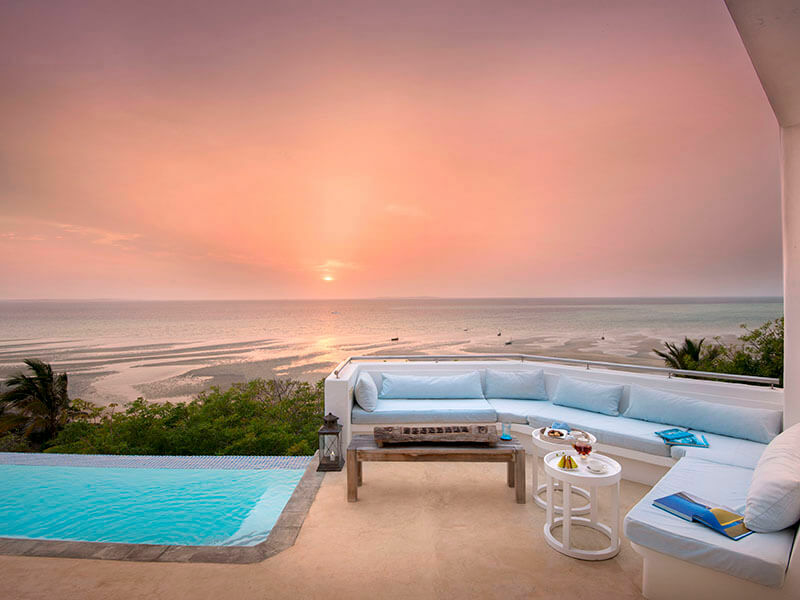 Villa Santorini Mozambique has so much more to offer: the tropical white beaches of the Bazaruto Archipelago, virgin coral reefs offering some of the best scuba diving in the world, and a wonderfully warm and relaxed African welcome. Here luxury goes hand in hand with a genuine humility and modesty that produce true richness and sophistication adding a welcoming warmth to its ambiance. 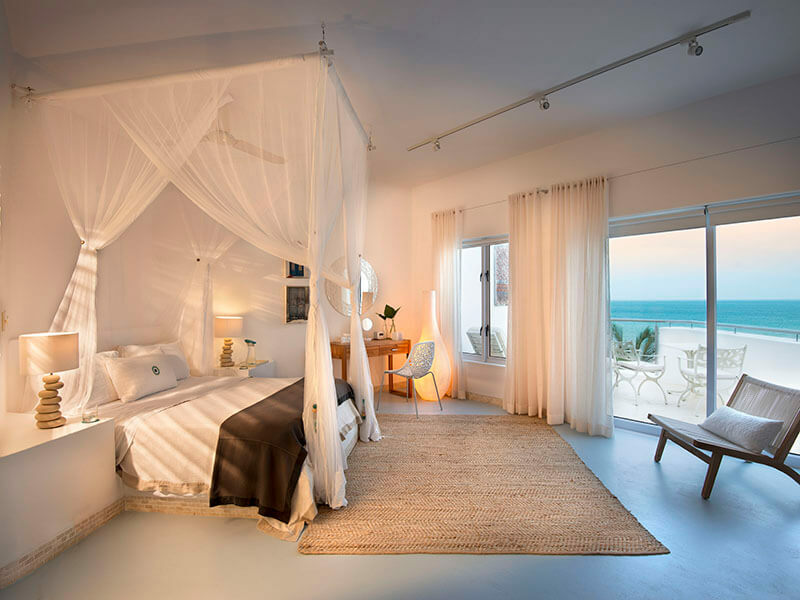 The sprawling, multi-level Grecian villa collection is inspired by the turquoise-hued waters it shares with the Greek Isles, and packs in all-white, domed structures with prime beach access just north of the Bazaruto Archipelago. Surrounded by dense forest and the Indian Ocean, guests are not only provided with utmost privacy but are also gifted with an underwater wonderland and plenty of water and land sports to pass the time! The open plan, multi-level main villa is the heart-space around which Santorini Villas has evolved. A sprawling villa with extensive and enchanting hideaways, and certainly the best premium private villa accommodation in Vilanculos. 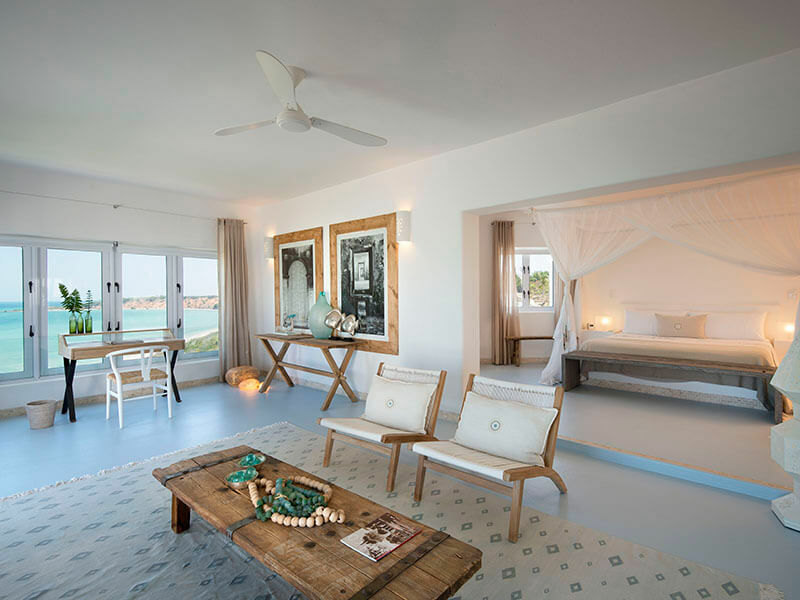 The main Santorini villa consists of five individual, spacious suites with gorgeous décor and elegant bathrooms, each unique in design and feel. 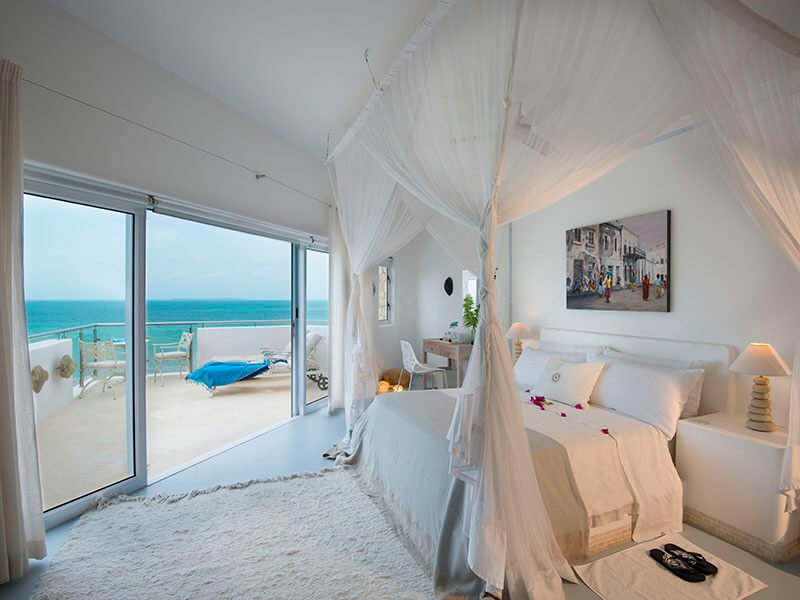 The suites open out onto their own private patio with sun loungers and umbrella – the perfect space to take in the majestic view of this magical place. The Chapel at Santorini is an exclusive use, intimate villa created for the ultimate honeymoon experience or romantic getaway. It’s the most lavish and lovely experience to have with your loved one! With amazing Mozambique honeymoon packages and stunning specials included and 50% off the stay for the bride! How can you not? 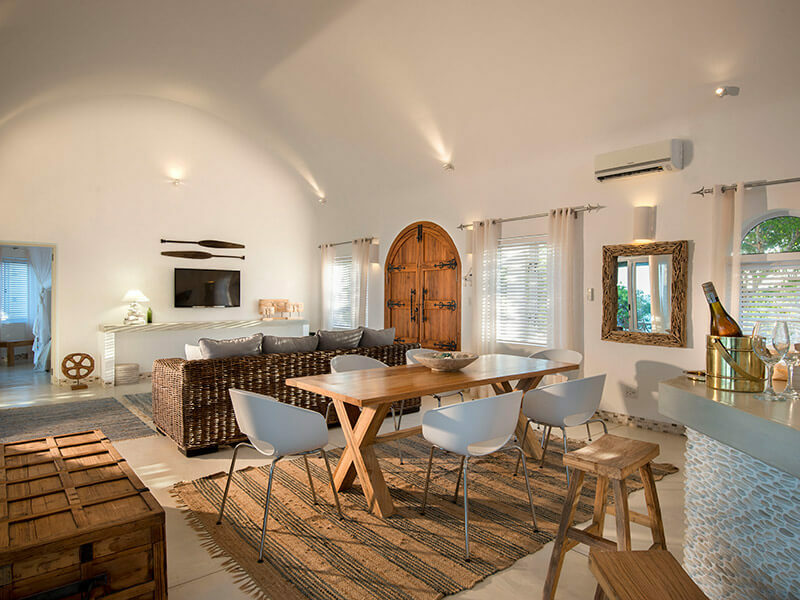 Villa da Praia is the exclusive beach villa – perfect for small and intimate groups of friends or families travelling together. 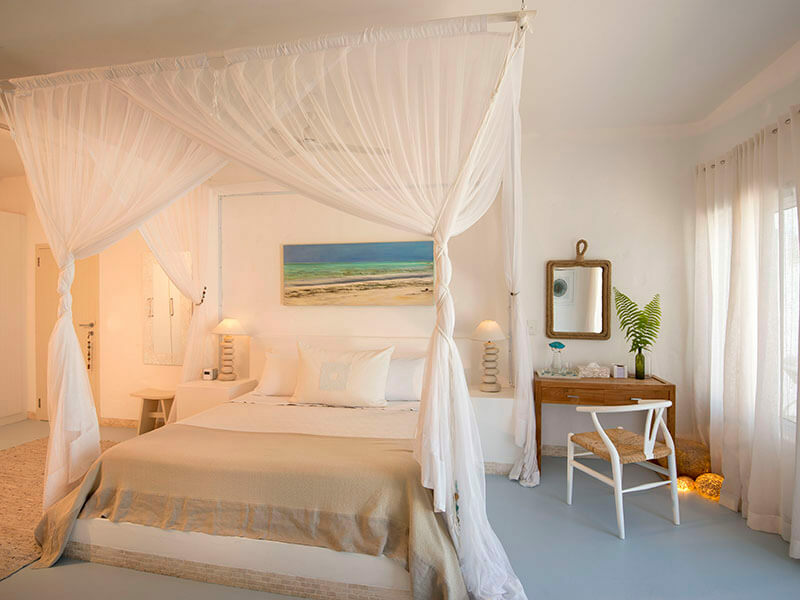 It consists of three stunning suites on different levels with king size beds, fitted mosquito netting and large bathrooms with gorgeous Charlotte Rhys amenities. The numerous living areas are each unique and mesmerizing in personal detail and the choice of places to rest, dine or relax are limitless. Whether you are drawn to the lounge, TV room, sunset sala or pool courtyard, you’re encouraged to make yourself completely at home. Lounging on the deck with the background rustle of palm leaves dancing in the breeze, one becomes immersed in this African paradise! A place where the rest of the world seems far away and one can become completely immersed in thought and relaxation – your own space to be rejuvenated and pampered by talented spa therapists. At Villa Santorini Mozambique local chefs produce this magic variety of tantalizing tastes throughout your stay. With a choice of up to 4 courses per meal, it’s a sensory explosion overlooking the beaches of Vilanculos! Imaginative, thoughtful table settings and where you eat are as much of a delight as what you eat. 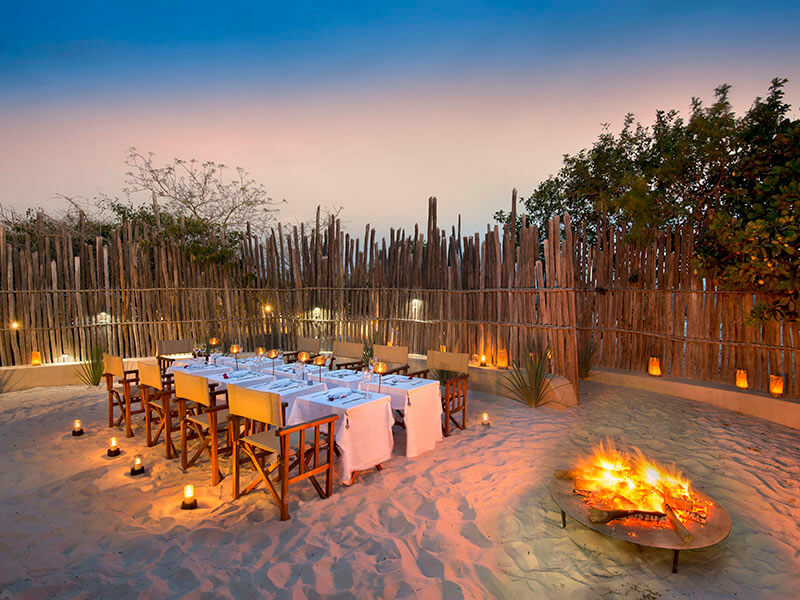 The open-air beach boma offers enchanting dining under the stars, where guests are treated and entertained by the local song and dance from the Santorini Family. A private, romantic beach picnic, for breakfast or lunch, promises luxurious food with an assortment of succulent meats, fish, fruit and vegetables. Let your dedicated, private host serve you delectable meals under the milky-way or sparkling cocktails by the rim flow turquoise pool while you take in the ever changing, indescribable panoramic views! And if you want to find out exactly where the Santorini Villas are located view our Mozambique map here. Beach volleyball, cricket and tennis. Assorted childrens activities and beach toys. Vilanculos is serviced by regular flights with both LAM (Mozambique Airlines) and SA AIRLINK as well as road access for our self-drive clients.